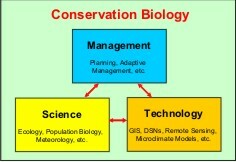 conservation biology principles including reserve design, population viability analysis, and habitat assessments. population status and habitat needs, to evaluate practical options for habitat restoration, and to implement conservation management plans. Checkerspot Butterfly (Euphydrya editha bayensis).